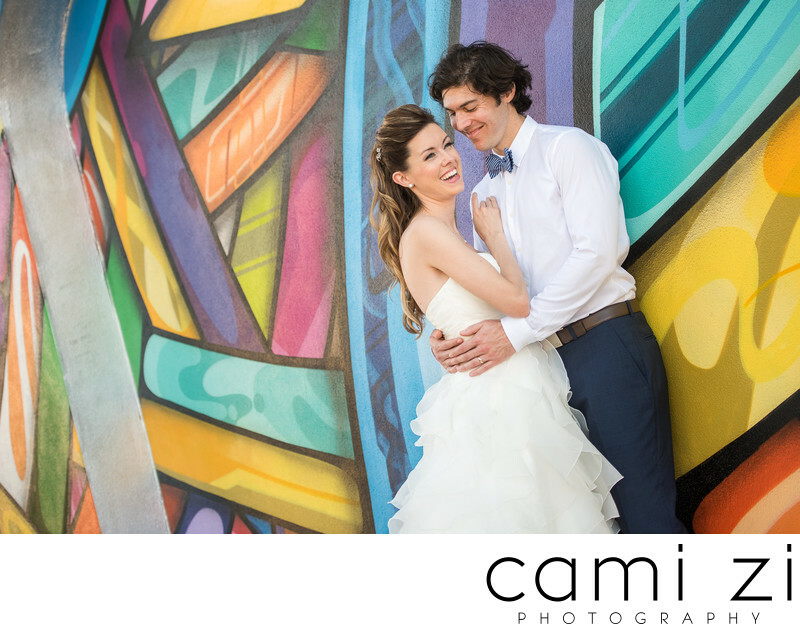 This stunning wedding photo shows the beautiful bride Kerry, and handsome groom Jose posing for their wedding portraits in front of this mural. This mural, located in downtown Saint Petersburg, was apart of the annual Shine festival. As we strolled around the streets of Saint Petersburg on the day of the wedding, the beautiful artwork stood out to us and we couldn't resist but pose by this particular piece of colorful street art near the Shine Festival by Apexer. You can see the joy on their faces as they hold each other close in a comforting embrace. This image brings such laughter and joy to my heart as the rich, bright colors of the background help to highlight the blushing bride and groom and their love. Location: 965 Central Ave, St. Petersburg, FL 33705. Keywords: colors (3), Couples (9), love (3), st petersburg (3), street art (3), wedding portrait (3).